Thousands of Changchun citizens attended the 2011 Infinitus World Walking Day (China) Changchun station event in World Sculpture Garden on Aug 27th. 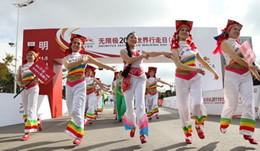 It is the ninth station of the all year event, and it is also the first time that this event came to Changchun. The city of Changchun was awarded China Happiest City many times and also one of the famous happy cities in China. World Walking Day event proposes citizens to walk 6000 steps every day, so as to encourage more people to participate in this activity, help them actualize the healthy life, promote home harmony, and make further progress towards happy city. 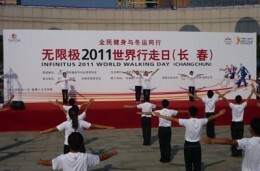 The ninth radio gymnastic exercise, established on the third National Fitness Day, was shown in the pre-event programs. The sport bureau officers designedly invited some professional gymnastics leaders to teach participants the skills of the exercises, which is trying to popularize these new exercises in Changchun. The bare foot walking experience zone attracted many citizens. They experienced the relaxing foot massage. All the participants walked with great passion and enjoyed the thousands people walking pageant.